Lets be honest… sometimes you just cant be bothered to cook and, depending where you live in Kampala, its not always easy for you to get a good supermarket. So what to do, what to do? The answer is finally here in the form of a comprehensive list of takeaway and delivery places in Kampala, compiled by yours truly here at living in Kampala! To be fair, most cafes and local restaurants will agree to pack up your food for you if you go down in person and wait. But who wants to do that? We want things now, now, NOW! So this list is for the impatient amongst us and focuses mainly on places that deliver or that will take orders over the phone for collection. FYI – All delivery charges are based on cost to deliver to Mengo because a) its really far out and random so if they’re willing to deliver there I’m pretty sure they will deliver anywhere and b) I live there… nuff said. But hopefully it will give you an idea of delivery costs and maybe even the urge to visit Mengo at some point. Stranger things have happened. Planning a movie night in with friends, pizzas and popcorn? 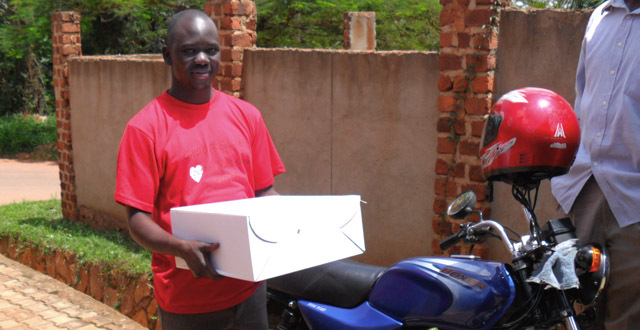 Well, look no further – there are a number of pizza delivery services in Kampala… the popcorn you’ll have to source yourself unfortunately. Mamba Point Pizzeria 0772 743 227 – Probably one of the better options for pizza in Kampala. Located in Nakasero on Akii Bua Road. Pizzas here cost between 18-28,000 for regular and 21-30,000 UGX for large and the delivery charges will set you back about 5,000 UGX to Mengo. It’s open for dinner from 6pm-10pm and closed Mondays. Olives Pizzeria 0750350350/ 0782232123- This is, in my opinion, the best pizza available in Kampala. The restaurant itself is located in Centenary gardens (having happily survived the recent demolitions) and is a nice eat-in venue. Pizzas range around the pretty standard 20,000 UGX mark and delivery charges are also in line with standard charges. Dominoes – (041) 425 1513 – A copycat version of the international dominoes, but still, deliveries to Mengo cost 6,000 UGX. The restaurant itself can be found on Kampala Road. Steers/Debonairs – (041) 423 1623/4 – Located next to Garden City shopping Centre, and with a branch on Kampala road, Steers is part of the South African burger and grill chain and also does takeaway/deliveries. In the same complex you will also find a Debonairs pizza, again another South African chain serving a range of pizzas. Deliveries to Mengo costs 3,000 to 4,000 UGX. One thing Kampala does well is Indian food, and there’s no shortage of Indian restaurants dotted around the capital. Here are a few that will deliver to your doorstep. Haandis – 077 426 2957 – The Garden City food court outlet of this popular Indian restaurant does deliveries. Does chicken and meat curries and a selection of other combos. The main restaurant (located on Kampala road – 041 434 6283) also does delivery but only for a minimum of 10 people, the delivery fee is 10,000 UGX. Sharma Tandoori – 0703 080177 – Another garden city food court Indian. Deliveries cost standard Boda Boda fare and a chicken tikka curry, for example, will set you back about 19,000 UGX (with either rice or naan). Pavement Tandoori – 0758 111132/0714 111132 – Located in Kisementi, this once staple of the Kampala Indian scene is now back – bigger and snazzier, and doing takeaway and delivery! With a wide selection of Indian, and some Chinese/Asian stuff, this place is particularly good for its selection of vegetarian curries. Delivery charge is 7,000 UGX to Mengo. Khana Khazana – 041 423 3049 / 0752 224000 – One of Kampala’s swankier Indian joints, found in Kololo on Acacia Avenue. Not on the cheapest side but it has a very wide menu and is probably one of the best Indians in Kampala. Delivery charges are set at the transport costs, but be warned that if the restaurant itself is very busy (i.e. on the weekends) they may not offer delivery at all. Kitchen opens at 7pm so deliveries are also only available after that. Lebanese – (041) 423 1623/4 – Again one of the Garden City food court eateries, it does especially good and authentic shawarma kebabs for 8,000 UGX. Prices for delivery to Mengo are between 6,000-7,000 UGX. Probably the most typical of the delivery food groups, luckily Kampala also has a few on offer so crack out your chopsticks and bowls, kick back and perhaps even pop on a Jackie Chan movie in preparation. The Wok – (041) 425 2168 – Located in garden city the Wok serves a mixture of pretty good Oriental food including Chinese and Thai, they will deliver for the price of a normal boda boda to your location (so quoted around 7-8,000 UGX for Mengo) with the caveat that you have to be able to explain to the boda boda where you live…not a mean feat out here! Fang Fang – (041) 434 4806/(041) 434 0067 – One of Kampala’s main Chinese restaurants, found on Colville Street, Nakasero. It has one of the more expensive boda boda delivery charges, however – based on the Mengo test – they quoted me 12,000 UGX. I tried ordering on a friday night at about 7.30pm and they told me they were too busy to deliver so if you live far from Nakasero be warned of this! Oriental Simply Thai – (041) 439 1000 – This Thai restaurant on the first floor of the Metropole Hotel is open for lunch from noon until 3pm and for dinner between 7pm and 11pm. After some long and somewhat painful discussions I managed to establish that they will do deliveries (although they prefer people to come and pick up the food). They basically send your food out in a metro taxi rather than boda boda so delivery charges are a bit more as you’re paying the price of the taxi. To send to Mengo they quoted me 30,000 UGX so you will need to decide whether it’s worth paying for a taxi rather than popping down yourself. Might work best for large orders for lots of people. The phone number will put you through to hotel reception and you just need to ask for the restaurant. Samurai – 0702700007 / 0782616845 – A Japanese joint located on the Gabba road, a little way past Kabala gala. They offer a mixture of sushi as well as traditional hot japanese dishes. They have take away and delivery and the only extra charge on top of the meal is the cost of the Boda Boda to your location. New York Kitchen – 0793 200775 – The famous bagel and pizza joint located in Garden City also has a less known function as a delivery service of food and even personalized birthday cakes and cupcakes. On last use they deliver as far out as Mengo and delivery charges are usually just around the price of a return boda ride to the area (i.e. 8-10,000 UGX). Take-away menus come with your delivery or can be picked up from the restaurant itself. Soho Cafe – 0392964011 – Found on Yusuf Lule road Soho offers a wide range of cafe food, coffees, smoothie and main course dishes. Its a great place to order a lunch from – whether it be to the office or at home. Delivery charges, were at the time of writing this FREE (!) although this may not last long… You can check out an example of the things on offer on their online menu. Brood Bakery – 0792 516266 – Found in the same complex as Nandos (see below) on Kampala road, Nakasero. This Dutch bakery is known for its great breads, especially the baguettes, and patisseries. Luckily for those of you who don’t live near their shop on Kampala road – they also deliver. Deliveries are done every day from 6AM till 7PM. Orders within Naksero are delivered for free and other areas delivery charges start form 4,000 UGX and vary depending on distance from the shop. (We were quoted about 6,000-8,000 UGX for Mengo). Online menu is available on their website. Quality Cuts sandwiches (041) 4510465- these are a staple lunch sandwich option for many office workers who buy them in shop from nakumatt, uchumi, tuskys and their signature butchery in Nsambya, but they also offer a delivery option – perfect for ordering in for the whole office. They offer a wide variety of meat and veggie sandwiches for around 7-8,000 UGX and menus are provided on delivery, picked up from the major supermarkets or online here. Nandos – (041) 434 0842 – Same name as the well-known (and by some well loved… but not me) global chicken fast food joints, but similarities pretty much stop there! Nandos here also has a mixture of burgers, pizza and chicken and one of the cheaper quotes for delivery (although yet to be confirmed if its actually true) – 3,000 UGX to Mengo. Nogamu – +256 312 26403 – Big thanks to Aaron for alerting me to this gem. Nogamu is an organic shop located on the Gaba road in Kabalagala. Rather than offering delivery of meals per say they instead offer the luxury option of having your groceries (and good quality ones at that) delivered to your doorstep! It’s an inspirational concept – acting as a membership organisation uniting small holders to promote organic agriculture. A list of products available can be found here. very informative article, i’m ashamed that a londoner would know about takeaways than I. comes in handy though. thanks lucy.